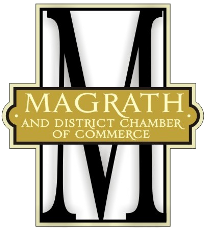 The Town of Magrath and The Magrath and District Chamber of Commerce Society join in inviting you to help sponsor our 11th Annual Magrath Hometown Christmas celebration scheduled for the evening of Thu 1 Dec 2016 from 5:30 pm to 8:30 pm. Approximately 20 tables have been available for booking each year to date (and we hope to find more spaces this year). NOTICE: If you plan to sell items for public consumption, it is your own responsibility to learn and follow all applicable regulations, for example if baked goods are to be offered for sale see the albertahealthservices.ca/EnvironmentalHealth/wf-eh-bake-sale-guidelines.pdf info page. Table rentals are only $30 for the evening ($20 for Chamber of Commerce members) Power access is $10 extra. Contact Roger Davies to book your table or submit request online (preferred) using link at right. Tables are booked on a first-come first-serve basis and are not officially allocated until paid for. Sorry, although we will attempt to book and group tables logically, we cannot guarantee exclusivity. The purpose of the Magrath Hometown Christmas is to promote local business and to encourage public support in shopping right here in our fair town. We are grateful for the public response to our efforts. It is a fun family event and a great local tradition for the past several years. Vendors are required to ensure they have met all health regulations and licence requirements for any public sales of food items. Additional table space may be also available at the Seniors Center – but they book their own tables at that location. We cannot guarantee exclusivity in booking tables. We book to individuals on a first-come first-serve basis who are pretty much free to try to sell whatever they want that evening. We do not always know exactly what that individual will be booking the table for, however, if specified, we do try to group bookings logically as best we can. That is to say, we try not to put two similar product categories in tables right next to each other. Other venues are also available throughout the night. Main street businesses can sell anything they want in their own stores (ie. they could rent out a table for anyone they wish in their own venue). The night of the event your table will be set up with your booking information at the assigned locations. There will be a plain white plastic 8' banquet table provided for each booking. You should be able to access your table starting at 5pm. Lighting ceremony starts at 6pm in front of town hall and should be complete by 6:30pm. Most shoppers start after the lighting ceremony.